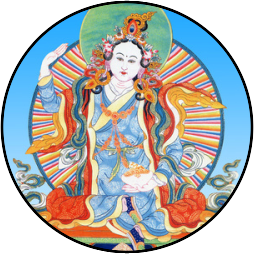 Yeshe Tsogyal was one of the main consorts of Guru Rinpoche and an incarnation of the Buddha Tara. She received nearly all the teachings given by Padmasambhava in Tibet and became the first Tibetan to attain Buddhahood. For many years after Guru Rinpoche left Tibet, Yeshe Tsogyal stayed to conceal ters, give teachings and empowerments and bless the land and people. She is considered to be like a mother to all Tibetans, watching over them and the land with great love and compassion.